In today's digital age, patients expect to be able to book their medical appointments online. This is why systems such as Zocdoc have gained such wide adoption across the medical industry. However, many dental practices still require patients to make a phone call in order to schedule appointments. Not only is this a major inconvenience for the patient that may make them reluctant to schedule their next appointment, but it's also an inefficient use of your staff's time. Fortunately, there are a few systems on the market that can help dental practices facilitate online bookings. In this article, we'll describe the benefits of these systems, explain how they work, and highlight the best options for dental practices to consider. Note that many of the systems that offer appointment booking capabilities also include patient communication capabilities. For the purpose of this article, we'll focus only on their online appointment booking capabilities. Just how important is online appointment scheduling? Online appointment scheduling is growing quickly. Management consulting firm Accenture published a study, where they estimated that across the medical industry, "by the end of 2019, 66 percent of US health systems will offer digital self-scheduling and 64 percent of patients will book appointments using digital tools. Nearly 38 percent of appointments will be self-scheduled—almost 986 million appointments—creating $3.2 billion in value." In addition to offering convenience, online appointment booking can give you access to patients who have a tough time scheduling an appointment during their workday. According to Zocdoc, 45% of appointments booked through its system are booked outside of business hours, and many patients see a doctor within 24 hours of requesting an appointment. Though you are unlikely to see a 45% increase in patient visits just by using one of these platforms, you will make it easier for patients who are too busy during the day to call your office in order to schedule an appointment. Many of these patients prefer the convenience of online booking, and will opt for one who provides this option, especially if they're looking for a new provider. Online appointment scheduling can also save your staff a substantial amount of time, which enables them to focus their attention on patients who are currently in the office, so that patients can have the best in-office experience possible. This is a much better use your staff's time than making phone calls, leaving voicemails, and handling subsequent followup phone calls. How do online appointment scheduling systems work? 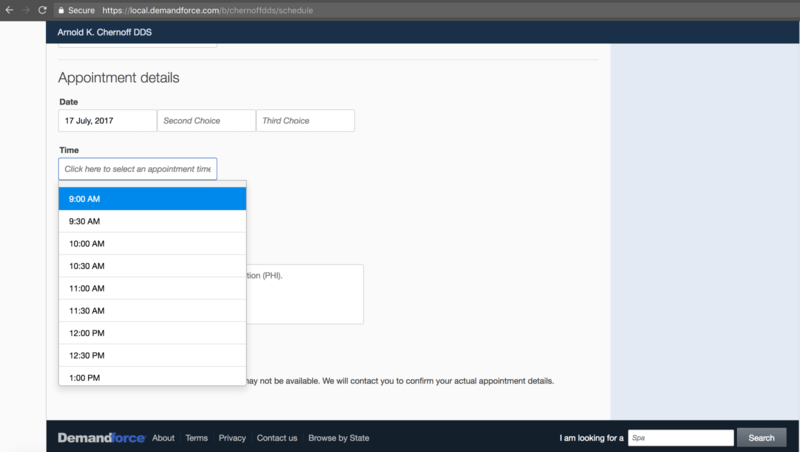 To enable patients to book appointments directly from your website (or Facebook profile), the online appointment booking system will provide you with a URL (hosted on their domain) that you can link to from your website. This URL is specific to your practice, so when users visit it, they'll be able to learn more about your practice, and book appointments directly. You won't need to design the website or create any of the scheduling functionality -- the hosting company has already taken care of it for you, and provides you with your own profile that you simply need to maintain. You'll just need to ensure that the information (contact information, practice hours, accepted insurance providers, services offered, etc.) is correct and up to date. Once you have this URL, you'll be able to link to it from your website or social media. In the ideal case, the online appointment booking system syncs with your practice management system, and displays the available times for each provider. Since both systems are up to date, this maximizes the chance that the time the patient requested is actually available. This is important from the patient's perspective, since patients find it frustrating to request a time, only to find out later that it's unavailable. If the requested time is unavailable, your staff will have to follow up with the patient to discuss other times that might work for them, which negates a lot of the convenience of online booking. It's also important to understand that many online appointment booking systems that claim to sync with your practice management software are only able to read your schedule, but are not able to write to it. In this case, after you confirm an appointment through the booking system, you'll have to manually enter the appointment into your practice management system. Ideally, the system you choose will be able to automatically enter appointment details into your practice management software. LocalMed is an example of one such system that accomplishes this. If the booking system doesn't sync with your practice management software at all, then patients can only email you in order to request times -- they won't actually know if the times are available. This would then require you to manually reach out to the patient in order to discuss alternative times, if all of the times that they requested are unavailable. Once you agree on a time, you'll also likely have to manually enter the appointment in your practice management system's schedule. This option is roughly equivalent to letting patients email you to request an appointment, which is not ideal, but still more convenient than requiring patients to make a phone call. Now that we understand how online appointment booking works, we'll walk through some of the top options for dental practices. LocalMed Pricing: $249/month, one-time setup fee, no long-term contract. Special offer for SoftwarePundit readers: use promo code "VALUEPENGUIN10" through our link to receive 10% off of your LocalMed setup fee. Though maybe less well-known than ZocDoc and Solutionreach, LocalMed offers the most robust online scheduling capabilities for dentists. LocalMed was designed specifically with dentists in mind, and currently only markets itself towards dental practices. It's also one of the most affordable options for online appointment scheduling systems. The major benefit to LocalMed is that it's not only able to read directly from your practice management system, but it can also write to it. 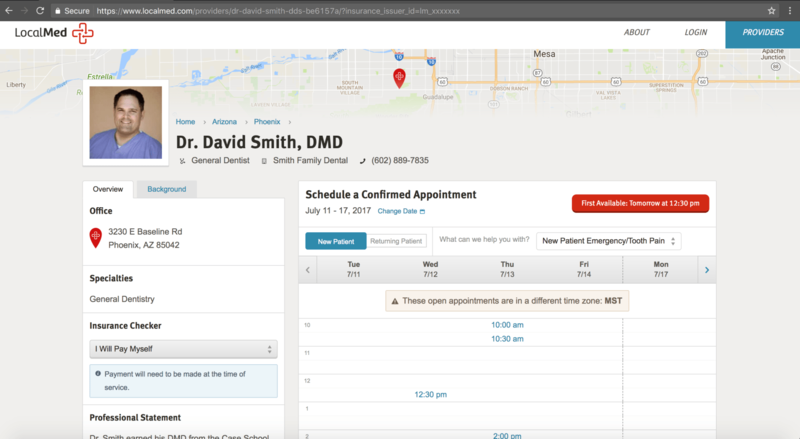 This means that when patients book appointments online through LocalMed, the appointment will immediately be confirmed and updated accordingly in your practice management system. In contrast, other systems are only able to read your schedule, and require you to manually enter the appointment into your practice management system. Given its affordable price point, and given that it's able to automate the entire booking process with the ability to both read and write to your practice management system, LocalMed is our top option for dental practices that are looking to provide online booking capabilities for their patients. Zocdoc is a top option not only for dentists, but for all medical practitioners. Each practice that signs up for Zocdoc will be provided with their own profile, which stores patient reviews, practice information (insurances accepted, hours, etc. ), and enables patients to book appointments online. If Zocdoc syncs with your practice management system, it will allow patients to see your actual schedule, so that they can request an available time. However, once a patient requests an appointment, you'll have to confirm it and manually enter it into your practice management system. Dr. Lawrence Spindel, who runs the Ask Dr. Spindel blog, is a Zocdoc user (you can read his thoughts on Zocdoc here.) You can see his Zocdoc profile below, which shows what a typical Zocdoc profile will look like to a prospective patient. You'll notice that for different days, there are different appointment times available. This is because Zocdoc integrates with Dr. Spindel's practice management system, Dentrix, so that his Zocdoc schedule accurately reflects his Dentrix schedule. 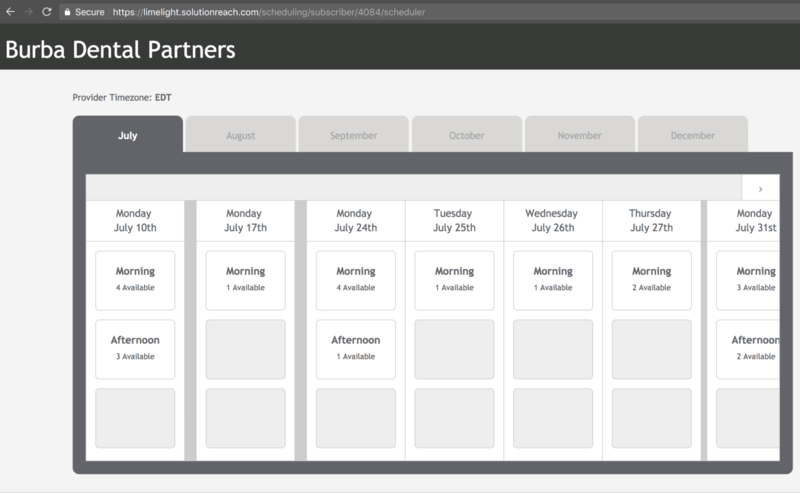 Solutionreach Limelight Pricing: $80/month, in addition to Solutionreach's $379/month base price. Requires long-term contract. Special offer for SoftwarePundit readers: Receive $25 Amazon Gift Card when you sign up for a Solutionreach demo through our referral link. Solutionreach is a popular automated patient communication system best known for its appointment reminders and for its patient recare features. However, as of 2015, the company began offering an online appointment booking module, known as Limelight, for an additional $80/month fee. This is an add-on module that is only available for practices that use Solutionreach. 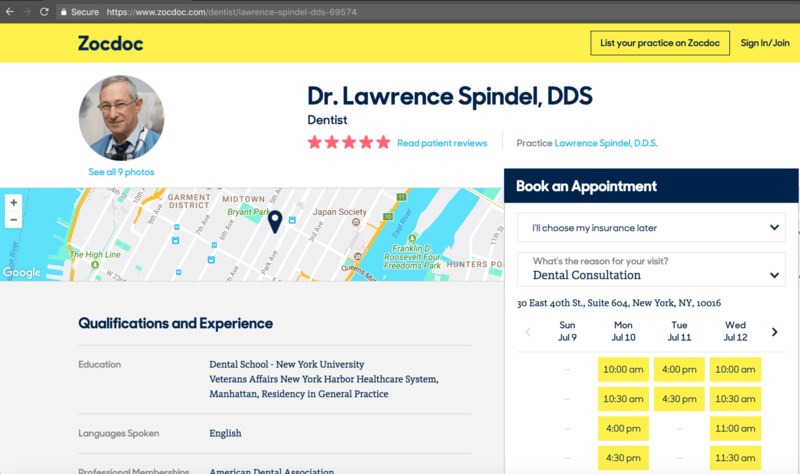 One subtle difference between Zocdoc and Limelight is that Zocdoc enables users to read reviews about your practice on the same page that they book appointments. On your Limelight profile, you won't have any reviews -- your reviews will be on your Solutionreach profile page. Though many Solutionreach customers use Limelight, some customers alternatively choose to use Solutionreach for its robust patient communication capabilities, and a system like LocalMed or Zocdoc for online booking. Demandforce Pricing: Included in Demandforce's $299/month base price. Though Demandforce is a popular patient communication system, it also offers online appointment booking capabilities, which are included in its base price. Like Zocdoc, the online booking is done from your Demandforce profile, and it also displays reviews from patients (reviews that Demandforce helps solicit on your behalf). 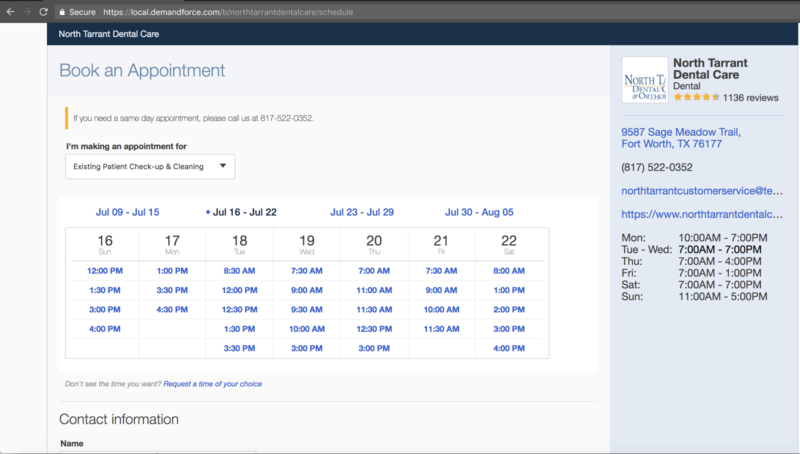 However, Demandforce's online appointment booking functionality isn't as robust as the other systems mentioned above. In most cases, the schedule doesn't appear to be up-to-date with your practice management system. Whereas other systems let you see the available inventory for appointment slots, patients booking through Demandforce Local will only see the hours your practice is open. When patients request for a certain time, they won't know if it's available or not -- your practice will need to confirm the appointment, or ask them if another time would work for them. This can add a lot of additional overhead, and negates many of the benefits and convenience that comes with booking appointments online. As you can see above, virtually every time slot is available. This is because this practice's schedule on Demandforce Local isn't in sync with their practice management system. From the patient's perspective, this isn't very convenient, and will likely result in them receiving a phone call to try to schedule an alternative time. This updated functionality will accurately display the available inventory, but will not have write capabilities to your practice management software. So, you'll still have to enter the confirmed appointments into your system manually. However, the nice benefit is that this functionality will still be included in Demandforce's $299/month base price.